ZIMBABWE REMAINS on a knife edge on Thursday morning after post-election violence which saw at least three people dead scores injured and police invoking the Public Order Security Act. Military and Police on fire. Zim elections have led to protest and clashes in the country, that led to deaths, injuries and torching of buildings and cars. 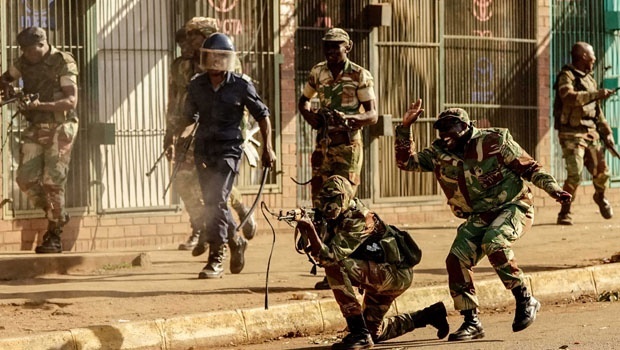 The act, which forbids public gatherings, was enforced after clashes broke out in Harare between soldiers and civilians who had been protesting the ruling Zanu-PF majority win in parliament. Live ammunition was used to disperse the crowds, leading to pandemonium in the capital. Army patrols continued into the night on the streets of Harare. Zimbabwean police have defended their decision to call for army back up to deal with Wednesday’s violence in Harare, saying they did not have enough officers. The US Embassy in Harare has urged the military to exercise restraint while diffusing tensions, saying it is deeply concerned about how it dealt with civilians. Meanwhile, while the opposition MDC Alliance says it is not taking responsibility for the violence while in his address to the nation on Wednesday night, President Emmerson Mnangangwa called on political parties to accept that in any electoral process there are winners and losers. Blood could be seen on the streets of Zimbabwe after police used live ammunition on civilians and protesters who accused the electoral commission of rigging results. Members of the media have also been assaulted and some had their equipment broken.